Hi Brooke….I work long days and still want to feed my family a nourishing meal. What can I do in an hour or so? HERE IS MY SOLUTION: An easy fish dish with a snappy lemon sauce. Round out the meal with roasted potatoes which go in the oven 5 minutes before the fish. This recipe uses some of the mild white fish, like true cod and petrel sole, and juicy asparagus that is in season right now. Both the fish and asparagus get roasted in the oven on the same pan at the same time making it quick to fix and clean up a snap. Preheat the oven to 400F. Mix the mayonnaise and the lemon juice in a small bowl. Rinse the fish and dry it off with paper towels. Spread out the breadcrumbs on a sheet of waxed paper. Paint both sides of the fish with the mayonnaise mixture and then coat both sides completely with the crumbs. Season fish with salt and pepper. Lightly oil a large sheet tray with some olive oil. Place the fish on one end of the sheet tray. Toss the asparagus with one tablespoon olive oil and salt and pepper and spread out in one layer at the other end of the tray. 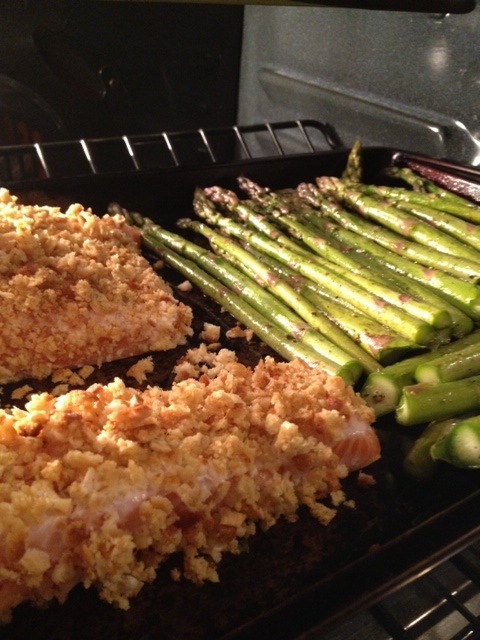 Roast in the oven for about 10-15 minutes until the fish is golden brown and flaky and the asparagus is tender when poked with a sharp knife. While the fish is cooking make the sauce. Mix the garlic, mustard and lemon juice in a small bowl. Gradually dribble in the olive oil to form an emulsion. Season to taste with salt and pepper. When the fish and asparagus are done, place 4 or 5 spears of asparagus on each plate. Top the asparagus with a portion of fish and drizzle a bit of the sauce overall. Serve immediately. Preheat oven to 400 F. Toss potatoes in a medium bowl with all other ingredients and turn onto a medium sheet tray. Put in oven about 5 minutes before the fish and asparagus, total roasting time for potatoes will be around 20-25 minutes. 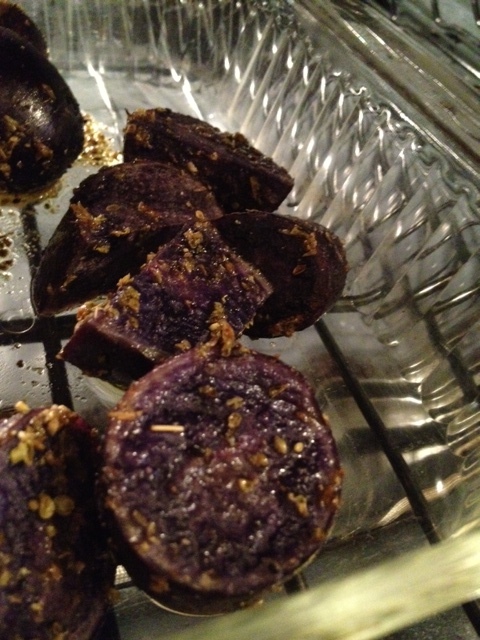 This entry was posted in Main Courses, Recipes, Uncategorized and tagged olive oil, roasted potatoes, salt and pepper. Bookmark the permalink.